§ August 14th, 2006 § Filed under swamp thing Comments Off on House of Secrets #92. 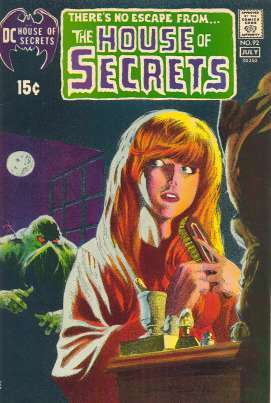 House of Secrets #92 (June/July 1971) featured an eight-page story by Len Wein and Berni Wrightson titled “Swamp Thing,” about love, betrayal, revenge, and a swamp monster, taking place approximately in the early 1900s. Sales were brisk, and reader reaction was positive, so this one-shot Swamp Thing story was retooled into an ongoing adventure strip set in the present day (resulting in some highly regarded comics, some less-regarded feature films, a live action TV series and cartoon, an action figure line, and, yes, even chalk). DC Special Blue Ribbon Digest #9 (May 1981) was the first time I was able to purchase the story from House of Secrets #92 for myself. This particular tale certainly stood out among the bright and cheery origin stories of the Atom and Krypto the Superdog. This is Copy #1 of this story in the Vast Mikester Archives. Saga of the Swamp Thing #33 (February 1985) was a fill-in issue of sorts, which contained a reprint of the House of Secrets story, making this Copy #2 of this story in my collection. The new framing sequence for this story, which drew a connection between the original Swamp Thing and the newer Alec Holland version of the character, makes what could have been just a fill-in into one of the most important and influential comics of the series. 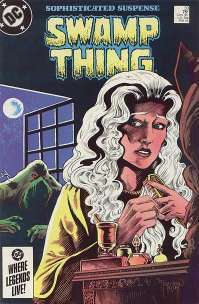 Not only did it establish that the current Swamp Thing was the latest in a long chain of swamp creatures throughout Earth’s history (a plot thread that would play out through the rest of this series), but it also gave us the first “modern” usage of the old DC horror comic hosts Cain and Abel. Cain and Abel, formerly humorous wiseacres introducing short scary comic stories in their respective anthology titles, were now explicitly described as the Cain and Abel from Christian theology, Cain continuously murdering Abel in an eternal repeating cycle. This new (or old, I suppose) interpretation of these hosts was carried into Neil Gaiman’s Sandman and its spin-off, The Dreaming . Roots of the Swamp Thing #5 (November 1986) was a deluxe format reprint series, representing the first ten issues of the original Swamp Thing series by Wein and Wrightson recolored and, for the first time, on nice, bright white paper. As a bonus feature, this last issue of this series included the original House of Secrets story, making this Copy #3 in my possession. 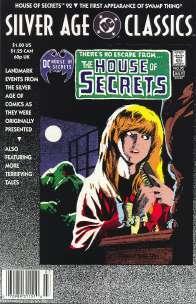 House of Secrets #92 (June/July 1971) – At some point in the late 1980s, I was able to purchase for myself an actual copy of the original House of Secrets appearance. The comic looked like it had been hit by a truck, and I think someone had used it to clean a shellac brush, but it was only a couple bucks and, by God, I finally had an original copy of the story (making it Copy #4 in the collection). Swamp Thing: Dark Genesis trade paperback (first printing, 1991) – This trade collected the classic ten-issue run by Wein and Wrightson, and also contained the House of Secrets story. This is Copy #5 of the story in my possession. House of Secrets #92 (June/July 1971) – At some point in the early 1990s, I was able to upgrade my first copy of House of Secrets #92, which a generous man with poor vision would have graded as “Poor to Fair,” to a copy in Very Fine. Set me back a cool $60, but given what it would cost now to buy it, I ain’t complaining. Let’s call this Copy #4a, which is also the copy I scanned for the image at the top of this post. DC Silver Age Classics House of Secrets #92 (1992) – To commemorate the end of their printing comics at the World Color Press plant in Sparta, IL, DC released a series of classic comic reprints that were the last books off of those presses. Among the “Silver Age Classics” was House of Secrets #92, which kinda stretched the definition of “Silver Age” a little, but, since I apparently needed Copy #6 of the original Swamp Thing story, I was willing to overlook that little fact. Essential Vertigo: Swamp Thing #14 (December 1997) – DC Comics began reprinting the Alan Moore issues of Swamp Thing in black and white in this series, partially to show off the fine linework in the art, but mostly because it would have cost too much to recolor everything for the new offset printing process. Anyway, this issue reprints Swamp Thing #33, mentioned above, making this a reprint of a fill-in with a reprint inside. I think this is the only U.S. printing of the original HoS story in black and white, but I know this is Copy #7 of the story that I’ve purchased. Millennium Edition: House of Secrets #92 (May 2000) – To celebrate the turn of the millennium, DC Comics released reprints of notable comics throughout the year (complete with a cool gold foil “Millennium Edition” stamp on the cover that was designed by one of my long-time customers). And, yes, House of Secrets #92 made an appearance, and, yes, I made it Copy #8 of the story in my collection. And I know there are more reprints of the story out there. One of the Swamp Thing trades reprinting the Alan Moore run contains issue #33, and I believe there were a series of black and white reprints in the U.K. that also contained that same issue. But, for now, I think eight copies of the same story is plenty. I don’t want people to think I’m obsessed or anything.